Are you looking for a good quality double curved curtain rod? There are definitely some benefits- the dual rod keeps the liner and curtain separate, prevents the curtain from getting wet and also just looks a lot nicer since the liner doesn’t stick and the curtain falls nicely. A curved double curtain rod does give a touch of elegance to your bathroom and is a simple and relatively inexpensive upgrade. Have you started looking for a new shower curtain rod but you don’t know which one to chose with so many different ones for sale? 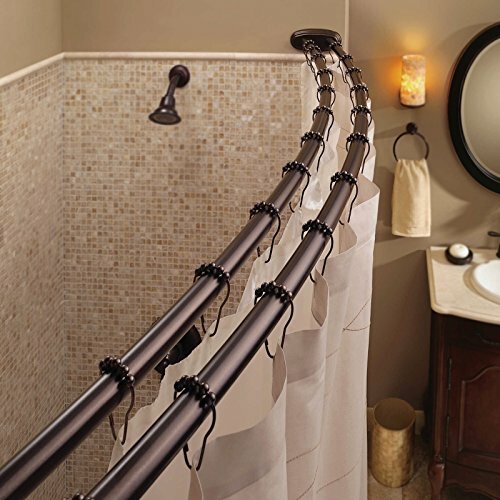 We’ve reviewed the best double curved shower curtain rods in the market in order to properly assist you in your search. 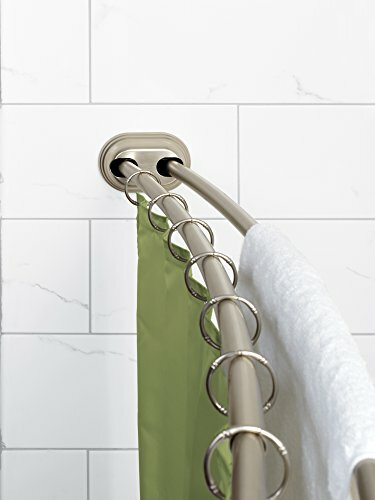 If you’re in a hurry, we’ll jump to the end and quickly tell you that we concluded the Double Curved Tension Shower Curtain Rod by Zena Home comes out a bit ahead of its competition. Setup process: It is important to make sure that the instruction manual is crystal clear and that the rod isn’t difficult to set up. We looked for curtain rods that had a relatively easy setup and didn’t require any unusual tools. Sturdiness: Once installed, the curtain rod should be able to hold its own through regular wear and tear. Whenever making a purchase, it is important to make sure that the product won’t fall off in a few weeks after installation. Withstanding rust: Exposure to moisture and water are natural things in a bathroom, so curtain rods should be able to stay rust-free for years after being exposed to shower water daily. Both its design and material will dictate whether this is true or not. The aluminum composition on this Zena Home curtain rod is one of its main important features, allowing the curtain rod to stay free of rust for a long time. In fact, it’s a daunting task to find an owner complaining of rust given how well made the product is. The rod should fit on any standard tub opening, though the company warns it doesn’t go past 72 inches. The shape of the rod is tapered, so it allows a bit more freedom inside the shower. This could actually prove to be a negative feature if your shower is strictly designed in a straight shape, as it would cause water to splash outside. Although the quality of the product is very good according to owners, the installation process is somewhat tedious to put together. The shower rod comes with countless tiny screws that make it very difficult to assemble and if not done exactly as instructed, the rod may fall down unexpectedly. Great product quality will protect the rod from unwanted rust. The installation process, although tedious, requires no drilling into the wall. Ideal rod for those living in a rented place. They can be used to hang towels without falling off. 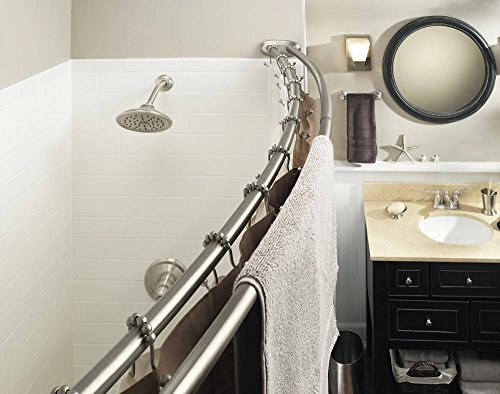 This practical curved rod by Moen can enlarge itself to fit any type of shower, and just like Zena Home’s curved rod, it also offers a versatile design that allows owners to move more freely in the shower. Once installed, the product is sturdy enough and it works properly for most owners. There is one problem, though. The product isn’t made of stainless steel and some owners who have had the product for more than 6 months claim that it already shows signs of rust. Also, installing it might not be as difficult as the last product we talked about, but it’s still a bit annoying and we suggest that you bring help from a family member or a friend to fight this issue. Looks very nice on the bathroom, according to owners. Dual-rod bending seems well made and provides great mobility for its owners. Ring movement doesn’t seem to scratch the metal. Some buyers find the installation process is annoying as it requires two people to do it. It can rust relatively quickly, which shortens its lifespan considerably. It should be drilled to the wall in order to function accordingly. Unlike its two previous counterparts, Bennington’s curved rod seems easy enough to install and should be ready to use soon after purchasing it. All in all, the material’s quality seems pretty great and it doesn’t rust easily. Owners claim it does a good job with keeping things in place and it gives a good look to the bathroom after installed. Unlike other products, this rod isn’t adjustable at all. Owners have said that in some instances you might need to cut it in order to properly make it fit, which could be a very unfortunate thing to do if you lack the tools or the craft for it. Apart from the fitting issues, the product looks and acts like a top quality rod. Measuring everything before purchase could make this the ideal buy for your bathroom. Easy to install, unlike other competitors’ products. Great quality materials prevent rust and allow for longer durability. Makes showers appear more spacious with its bent design, similar to the competitions’ but great nonetheless. You should properly measure both your bathroom walls and the size of this rod to make sure they properly fit as desired. Different curtain rods are made for different spaces, if you’re looking for a double curved shower curtain rod, the one by Zena Home seems to be a solid choice when it comes to durability and versatility. It seems to adapt to most bathroom types and offers a good lifespan, a feature certainly valued by its owners. If you are not familiar with Moen products, they are also definitely worth another look. You might find other designs more fitting, but this is certainly a great go-to choice if you don’t know what to buy! Refurbishing your bathroom? Take a look at our other shower accessory reviews and completely change the way you shower for the better! For example, a luxury rainfall showerhead can take your showering experience to the next level or if you live in a home with low water pressure, these showerheads can make the difference between a trickle or a torrent of water.